Apartment beach front with pool to 50 meters from the sandy beach, close to marine stroll and town centre. Panoramic sea view. Internet. Satellite TV. If you like the sea, you will love my apartment. Bright and sunny seafront apartment with shared pool and superb&quiet location at only 50 meters from the sandy beach, next to the Marine Stroll and town centre, you don't need to take the car to go to restaurants, supermarket, pharmacy. Its a perfect location for winter and summer holidays. 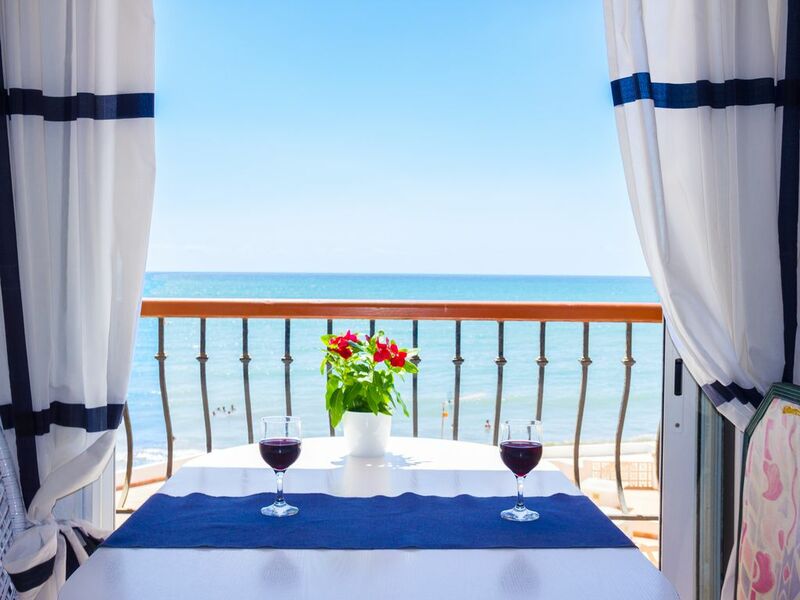 A covered terrace and balcony facing south with a impressive panoramic view of the Mediterranean, with 10 miles of sea and coast below you.It is everything that you need to relax and to disconnect your mind from the daily routine. It's one of a select few holiday apartment that offers direct access to the beach, no crossing of roads, footpaths or parks, an absolute beach holiday retreat with sea views from every room. You can hear the murmur of the waves lapping on the seashore and feel the sea breezes. In the winter, you can see the sun rise from the sea and set by the mountain. In the evening you can have dinner in the covered terrace and enjoy with the relaxing sea spectacle and the sunset view over the west mountains. You can walk along the beach 2 miles from the apartment. It is almost new, comfortable, sunny and warm in the Winter. Fully equipped for long and short stays. Astra TV satellite with English, German and French channels. Internet Wifi optional. See also properties nº 6265200 and nº 6145661. Very clean apartment well equipped for a self catering stay. TV, the only UK channel was Sky news. We found that washing and drying the bedding the same day inconvenient have to make sure you have a sunny day, a spare set would be better. Overall a relaxing stay. Antonio made us very welcome and we had no problems settling in to this lovely apartment with enviable sea views and balcony windows on two sides, allowing a natural sea breeze through the flat. Falling asleep to the sound of the sea was a treat! The apartment is within a stone's throw of a tiny local beach and a 5 - 10 minute walk from a much larger, more commercial beach. The location is very Spanish (which we loved), with restaurants and beach bars, as well as night time entertainment and market stalls in the square behind the apartment building - these often didn't start until gone10.30pm so it's important to adapt to the local rhythm of life!! The pools available for residents are great, and staffed by a lifeguard. Top tip - go down just after 5pm for a less busy swim! Muchas gracias Vanessa por vuestro amable y simpático comentario sobre la zona y el apartamento. Tu español es perfecto y ha sido un placer conversar con vosotros. Hasta la vista! El apartamento es precioso, acogedor, muy tranquilo y muy bien equipado. Con vistas estupendas. Muy cerca de la playa. Perfecto para parejas con hijos y para personas que le gusta tranquilidad. Antonio es un buen anfitrion y una buena persona. Si tiene algun problema o necesita cualquier cosa se soluciona todo al momento. el piso fantástico esta situado directo en el mar y tiene una vista de ensueño. El piso esta bien amueblado y tiene todos. Sen. Ariza esta muy amable. Trotz später Ankunft in der Nacht wurden wir von Antonio Ariza sehr herzlich in Empfang genommen. Die helle Wohnung ist voll ausgestattet - sogar mit Geschirrspüler und Waschmaschine. Den schönen Balkon nutzten wir zu viert gerne zum Frühstücken. Schade bei unserem Aufenthalt im Oktober war nur, dass der Pool schon winterfest gemacht worden war. Aber zum Schwimmen im Meer waren es nur wenige Schritte. Nachts genossen wir es, mit Meeresrauschen einzuschlafen. Es war ein rundum erholsamer Urlaub. Ho appena terminato una bellissima vacanza in Andalusia, ospite in questo bellissimo appartamento. La casa si trova praticamente a ridosso di una piccola cala, dove la spiaggia scende delicatamente verso questo mare cristallino. L’appartamento è esattamente come lo vedete nelle foto, niente è diverso, i colori, la descrizione. È un appartamento angolare con un balcone piccolo fronte mare e un terrazzo che si affaccia sul mare, ma dando uno sguardo anche alle montagne selvagge della bellissima Andalusia. Il terrazzo permette di mangiare fuori comodamente in 4 persone. L’appartamento è fornito di tutti gli elettrodomestici, grande assortimento e quantità di stoviglie. C’è l’aria condizionata, ma benché io sia stata lì nelle due settimane centrali di agosto, non ho avuto bisogno di accenderla neanche una volta, perché l'alloggio è molto ben arieggiato e fresco. Non ultimo il complesso dispone di un bel giardino con tre piscine di diverse altezze. Antonio è una persona splendida, gentilissima, che oltre ad averci offerto un appartamento con ogni confort, ci ha saputo consigliare sui posti migliori da visitare. Grazie Antonio di averci ospitato. Antonio, I know you don’t speak Italian, but I hope you’ll be able in any case case to understand my comments. I really want to thank you for everything. The reality was better than the expectations and our holiday was perfect in your appartament. Highway to Aguilas (Murcia). From Aguilas to San Juan de los terreros, 9 Km local road. San Juan de los Terreros is located at the Mojacar area, Almería coast (Andalucia), near the natural park of Cabo de Gata, to half of way between the cities of Almeria and Cartagena y Murcia. Fly to Almeria - Apartment is 105 km from the airport. Fly to Murcia - Apartment is 110 km. Fly to Alicante - Apartment is 170 km. EasyJet, Ryanair, from LGW, Luton and STD to The Almeria coastline is a large extent undiscovered by mass tourism. It has lovely villages, a wonderful nature reserve –Cabo de Gata- and lunar landscapes in Almería inland. Its beaches are credited with European Union environmental blue flags. The Costa de Almeria has the driest and warmest climate in Europe with an average rainfall of 11 inches and average annual sunshine of 320 days. Whilst a lot of the coast have been over developed with high rise blocks, nightclubs and kiss-me-quick mentality, this part of Spain remains traditional and friendly. The coastal resorts are more family-orientated and cater more to Golfers, walkers cyclists and relaxation seekers than clubbers. The freeway and local roads sure an easy access to beautiful beaches, natural parks, historic castles or larger towns for shopping. Covering 45,663ha of the Almeria region, the Natural Park Cabo de Gata is the Andalucia's largest coastal protected area. San Juan de los Terreros is located on a charming, quiet bay of the Almería Coastline, exotic and different, with crystalline and warm waters, rich in fauna and flora, with exclusive beaches and caves in which to bathe, dive or take the sun. Dry climate with low humidity rates all year long, which makes this place specially recommended for people suffering from allergy, lungs or chest. Over the last few years it has become a popular holiday destination with European and Spanish families. This has benefited the town with the recent building of a promenade along the beach and boulevards. Whilst lively and full of the town is ideal for holiday makers looking for a more sedate and relaxing place to have a glass of wine, lovely fish meal and a walk along the beach. Ideal for vacations from September to June. See personal Web site with more pictures, plan and details. The beaches of San Juan de los Terreros are one of the 37 Spanish beaches awarded with the quality flag of EU. The water temperature is so warm (23-27ºC) between May and October. -Parking slot in a street close to the apartment. -The garage option is not included in the rent price. Swimming pool open from June 15th to September 15th. Riding School. Natural Park Cabo de Gata, 35 km. Acuatic Park to 20 km. Attractions mini holiwood in the desert of Tabernas, about 50 km. The famous Aguilas carnival in February (5 milles). The typical Spanish Easter processions in Aguilas and Lorca. The nearest villages: Lorca, Aguilas, Garrucha, Mojácar, Huercal, Almería, Cartagena. Forma de pago: Pago anticipado del 25%. El saldo al recibir las llaves y vista la vivienda. Precio en Octubre, abril y mayo: 300 euros 1 semana, 500 euros 2 semanas (2 personas). Tarifas decrecientes en función de la duración, entrega de llaves realizada por propietario. El precio del alquiler incluye sábanas, toallas y los gastos de agua y electricidad, hasta un máximo de 50 KWH de electricidad a la semana, que corresponde al consumo medio semanal del último año. El consumo adicional lo paga el inquilino al precio de 0,20 euro/KWH. Fianza de 150 euros que se devuelve a la salida, deposito de reserva del 25%, entrega de llaves realizada por propietario. Reservas en Julio y Agosto: de sábado a sábado y 2 semanas mínimo.